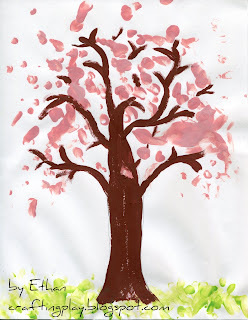 I found the idea for this project on the Handprint and Footprint Art Blog for a "Fingerprint Spring Cherry Blossom Tree." (Love!) In the original project, you can actually use it as a counting lesson (which is awesome!) I wanted to try it out and see how it would adapt for baby art. I used aluminum foil as a pallet and spread on the pink paint. I then helped Ethan dip his finger tips in the paint and helped him dab it on the paper. I'm not usually a big fan of directing where he puts the paint, so you can see that there are some smears where I let him add his own personal touch (maybe my favorite part of the whole tree!) Afterwards, I gave him some more paper and let him paint his heart out in his own way. When he woke up, we used the same technique as the flowers to paint the grass. He did a great job! Do you put his age on it somewhere? Thanks for leaving the link... I love to see what others have done :) Cute blog background too! Thanks! Ethan was 7 months old when he painted his spring tree. He loves to paint! Thanks for stopping by!! I got the best possible tree cutting service by tree cabling services for my backyard at the most affordable rates! I would like everyone to contact them because their service is out of this world!